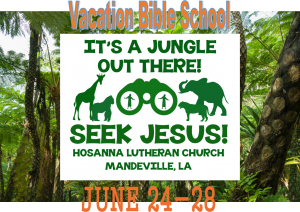 Vacation Bible School is a week of Jesus, games, crafts and a whole lot of fun. Put on completely by church volunteers, your child gets to learn Bible stories hands on, while they sing songs and play games. This exciting week is for children who will be in Kindergarten – 4th grade. Volunteer Opportunities are also available for children entering 5th grade-through High School as well as Adult Volunteer positions. Volunteer positions will be given to Hosanna members first. Non-Hosanna members will be determined based on need.